Isn’t it amazing that so many people take so many pictures to “preserve their memories”, only to have digital pics stored all over the place? I’m betting that you have hundreds, if not thousands, of digital snapshots scattered in thumb drives, cameras, and PC hard drives throughout your house. This is not counting the low resolution ones taken by your cellular phone. I swear, the digital revolution was the best and worst thing to happen to photography. Designer Gregory Siegal has created the LifeMap to solve the tedious problem of organizing the mixup of photos that plague most families. 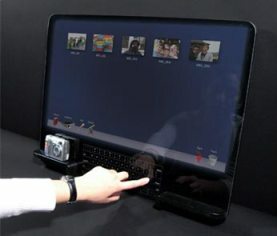 This digital photo album has a touchscreen and keyboard interface, and can hang on the wall or be used on a lap. As you can see, the user simply attaches the digital camera to the LifeMap, and then the user can tag their pictures with people, places, and keywords. From there, the photos can be organized in a timeline, or even a world map. According to the official web site, LifeMap will grow as the family grows. In other words, the LifeMap is a scrapbook without the paper, and all the other tools necessary to cut and paste photos and other pieces of paper associated with memories. If you have someone in your family who scrapbooks, then the LifeMap will make their job a whole lot easier. It is concept for now, but I’m hoping that the LifeMap will adorn my wall one day.